NLP as a business opportunity - The Tad James Co.
Home » NLP as a business opportunity - The Tad James Co. Your income is directly connected with your skills! 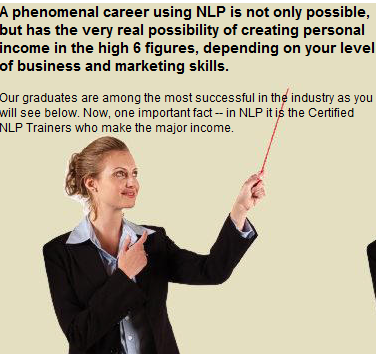 Stop for a moment and consider a phenomenal career using NLP. It is not only possible, but has the possibility of creating personal income in the high 6 figures, depending on your level of business and marketing skills. 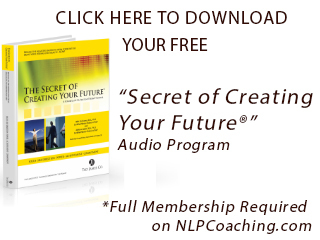 You too can discover how to become a seminar leader using NLP. Learn the secrets of doing successful business coaching and consulting with large groups. In the process, you will become the most charismatic and transformational presenter. NLP has the most technologically advanced communication and training skills available for business, management, sales, therapy, and education. You will become a master of persuasion and will be able to influence others to break through limitations. In a business world with ever-changing needs, you will be able to assist groups to let go of negative emotions. At the same time, implementing strategies for creating an extraordinary quality of life for individuals and organizations alike. You, too can discover how to become a seminar leader using NLP and learn the secret of doing successful business coaching and consulting with large groups. In the process you will become the most charismatic and transformational presenter . You will become a master of persuasion using all your skills with integrity, and will be able to influence others to break through limitations. In a business world with ever-changing needs, you will be able to assist groups to let go of negative emotions. limiting decisions and limiting beliefs, at the same time implementing strategies for creating an extraordinary quality of life for individuals and organizations alike. NLP has the most technologically advanced skills available today for business, management, sales, therapy, and education. You will learn the most advanced set of communication, and training skills available today. What are they? Neuro Linguistic Programming! For more than 30 years, Tad James, M.S., Ph.D. has been training people to become Trainers of Neuro Linguistic Programming. Over the past 30 years we have trained more people as Certified Trainers of NLP than anyone else in the world. There are other trainer’s trainings that will not certify you — we do! This is important to you, because it means that you have the best chance of being certified as a trainer, and the best chance of being a success when you study with us. Our graduates are the most successful NLP and Hypnosis trainers in the world. If you really want to be a successful Trainer then you really must consider this training. Even if you do not want to become a full-time NLP trainer, this training will help you to become the most magnificent presenter of your ideas possible. 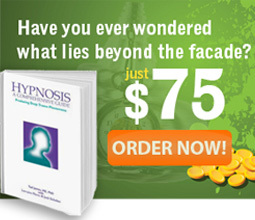 This Training meets the standards of the American Board of Neuro Linguistic Programming. It also meets the national NLP standards in every other country in the world. Your certification has worldwide recognition. Over the past 30 years, we have trained more people as Certified Trainers of NLP than anyone else in the world. In addition, WE CERTIFY YOU! Your certification has worldwide recognition and this training meets the standards of the American Board of Neuro Linguistic Programming and the national NLP standards in every other country worldwide. This means that you have the best chance of being certified as a trainer, and the best chance of being a success when you study with us. Our graduates are the most successful NLP and Hypnosis trainers in the world. If you really want to be a successful Trainer, then YOU MUST consider this training. Even if you do not want to become a full-time NLP trainer, this training will help you become a magnificent presenter. You will need to attend three trainings.